I haven’t posted a meal plan in a while because, well, to be honest they had got pretty damn boring. The last few weeks have been a stressful time. We’ve not been at home a lot because of holidays, weddings, and a hospital stay. At the start of this month Jon underwent heart surgery so we’ve had a lot of other things on our mind. There has rarely been fresh food in our fridge, our washing and ironing baskets are overflowing and the flat could really do with a clean. Domestic goddess I am not right now. So, to get back on track, I’m taking drastic action. Our slow cooker comes in very handy in the colder months when we want hearty hot dinners without putting too much effort it. Now I’m really putting it to the test by making meals that I can prep in advance and store in the freezer ahead of chucking in the slow cooker. I’m hoping this will buy us more time to get the flat organised and (if I’m lucky) get us exercising again in the evenings. I’m dieing to get out and go for a run! Since freezing days and sometimes even weeks worth of meals before I’ve even cooked them dinner has become insanely easy. Previously I was preparing my slow cooker meal the night before, leaving it in the crock pot overnight then switching it on in the morning. 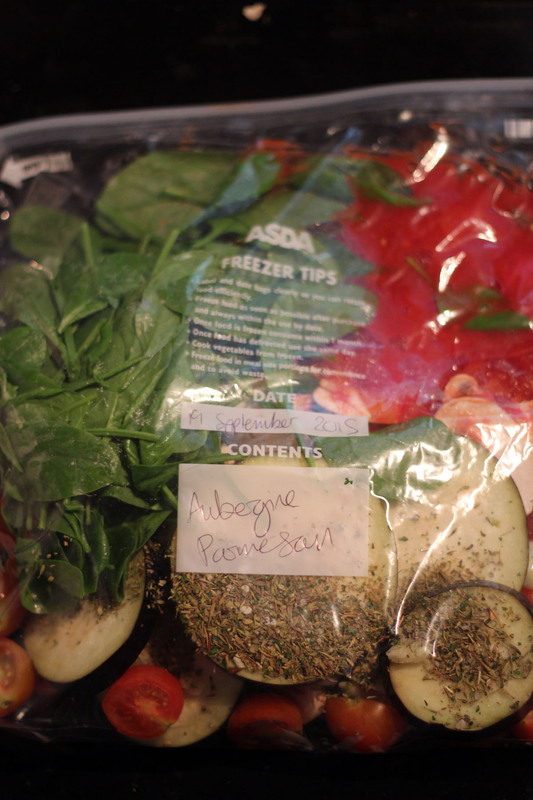 With a bit of careful planning I can buy the ingredients, prepare the meal and freeze it in just a couple of hours. I get the meal out of the freezer the night before so it defrosts, then all I have to do in the morning before work is tip the contents out into the slow cooker. No more preparing meals mid-week AT ALL! 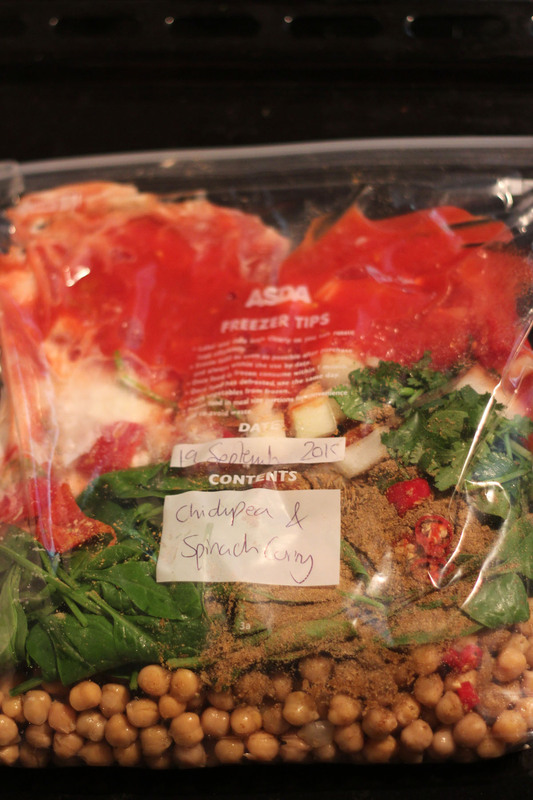 Batch freezing is just the next logical step on from batch cooking and we all know how much batch cooking saves you money. By buying in bulk I get much better deals on my fresh fruit and veggies making my meals even cheaper per portion. Freezing fresh vegetables helps to lock the goodness in! Although these dinners come straight from the freezer, because they are prepared using fresh vegetables they are still really good for you! It’s a frozen ready meal without the added salt, sugar and other nasty additives that you often find in processed food. With these meals in your freezer you can sleep easy at night knowing that you’re feeding your family healthy AND tasty food. They are as easy as leftovers but don’t have that leftover taste. Some things taste better leftover, in fact I love a lasagne that’s a couple of days old and re-heated in the microwave. (I’ll probably go to food blogger jail for admitting that…) These recipes are as easy as pulling leftovers out of your freezer but they are fresh and full of flavour, unlike a lot of reheated leftovers that leave a lot to be desired. 5. They help you stay in CONTROL! Last but not least, these freezer meals appeal to the control freak in me. For minimal effort I have a whole bank of recipes in my freezer ready to go. Some might require the odd garnish or touch of cream towards the end of cooking but on the whole, I know that at any one time I can prepare a delicious meal without any thought on my part. I can even entrust the other half to prepare dinner as all of the ingredients have already been chopped and weighed out for him! Perfect. 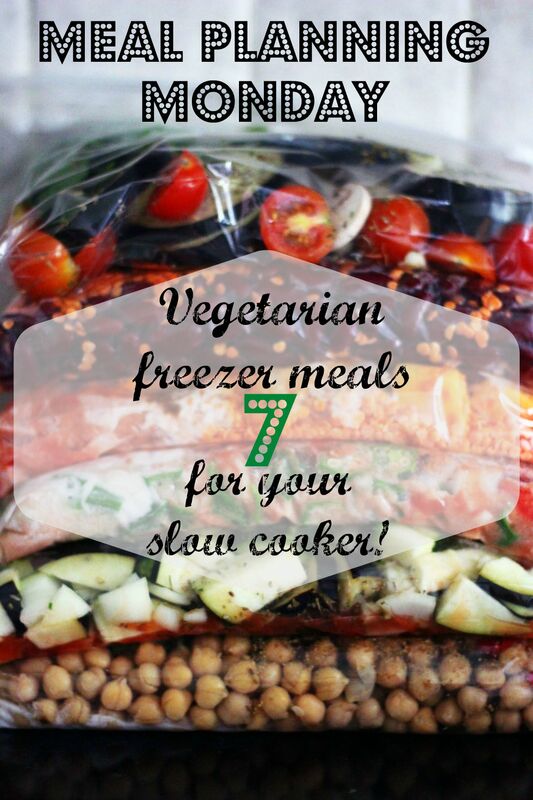 This week I’m sharing seven of the easiest freezer meals for your slow cooker but don’t worry there are plenty more where this came from! Each of these recipes is designed to feed 2 people and to fit into a 1.5 litre slow cooker. Serving suggestions are at the end of each “recipe”. They also all have long cook times so that you can leave them in the slow cooker all day while you are at work. This does mean its a good idea to keep your vegetables chunky so they don’t completely go to mush! Enjoy. 1 aubergine, 1/2 an onion, 2 handfuls spinach, 1 handful of cherry tomatoes, 5 mushrooms (sliced), 3 cloves garlic, 1tbsp tomato puree, 1 tbsp oregano, 1 tsp dried basil and 1 can tinned tomatoes. Place the ingredients into a zip-lock bag and freeze until the night before needed. Defrost overnight the day before cooking. 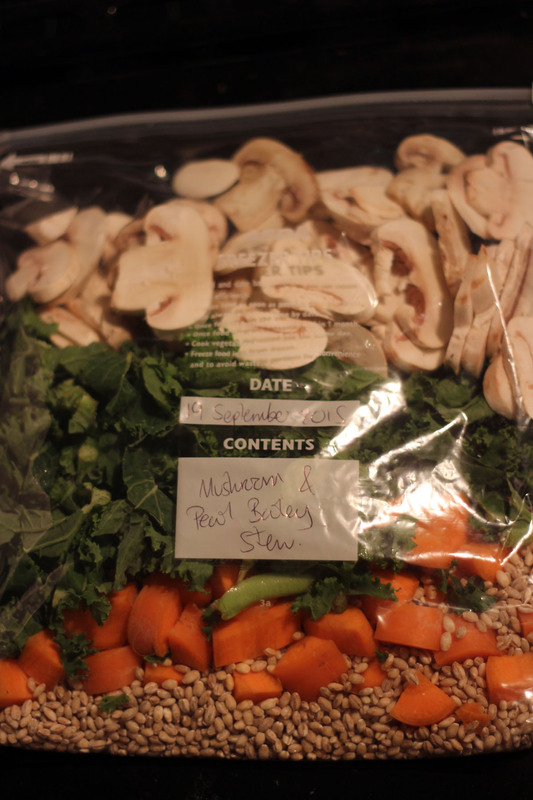 In the morning, place the entire contents of the bag into the slow cooker and top up with water until the maximum level on your slow cooker has been reached. Cook on LOW for 8-10 hours. If the sauce is a little thin turn your slow cooker on high and leave the lid off for the last half hour before adding the topping. Top with slices of mozzarella cheese, parmesan and breadcrumbs for the last 30 minutes. 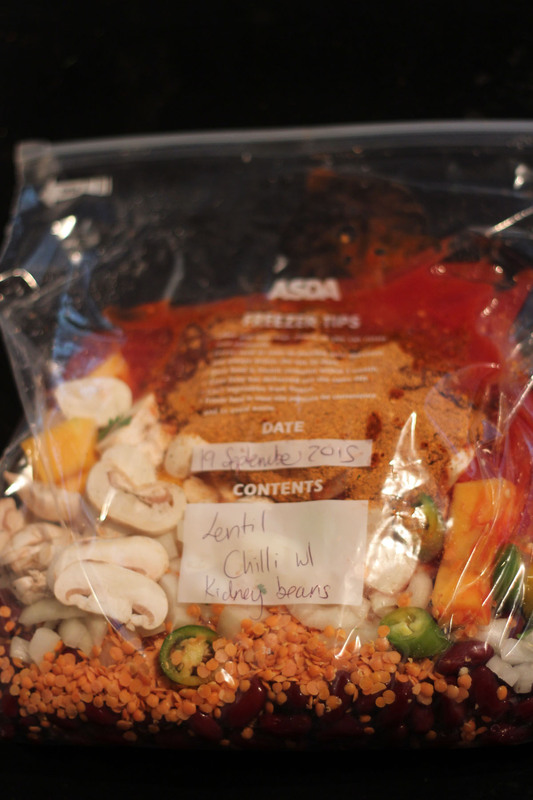 This is one of my favourite curry recipes which can easily be altered for the freezer. Take the ingredients found in my original blog post here. Place all of the ingredients into a zip-lock bag and freeze until the night before needed. Defrost overnight the day before cooking. In the morning, place into the slow cooker and top up with water as necessary. Cook on LOW for 8-10 hours. If the sauce is a little thin turn your slow cooker on high and leave the lid off for the last half hour. 1 can of kidney beans, 1 cup of red lentils, 1 can tinned tomatoes, 4 mushrooms (sliced), 1/2 a butternut squash (cubed), 1 small onion (diced), 1 green pepper (diced), 1 green chilli (sliced), 1 dried chipotle chilli, 2 tsp paprika, 2 tsp cumin, 1 tsp cayenne pepper, and fresh coriander. Serve with fluffy white rice, sour cream and cheese as desired. 1 can of chickpeas, 1 tin of tomatoes, 1 tin of coconut milk, 2 large handfuls of spinach, 1 red pepper (diced), 1 onion (diced), 3 tsp garam masala, 2 tsp chilli, 1 tsp turmeric, 1 tsp ginger, 1 tsp cumin seeds and fresh coriander. Place into a zip-lock freezer bag and freeze until the night before needed. Defrost overnight the day before cooking. Serve over fluffy white rice and/or a naan. 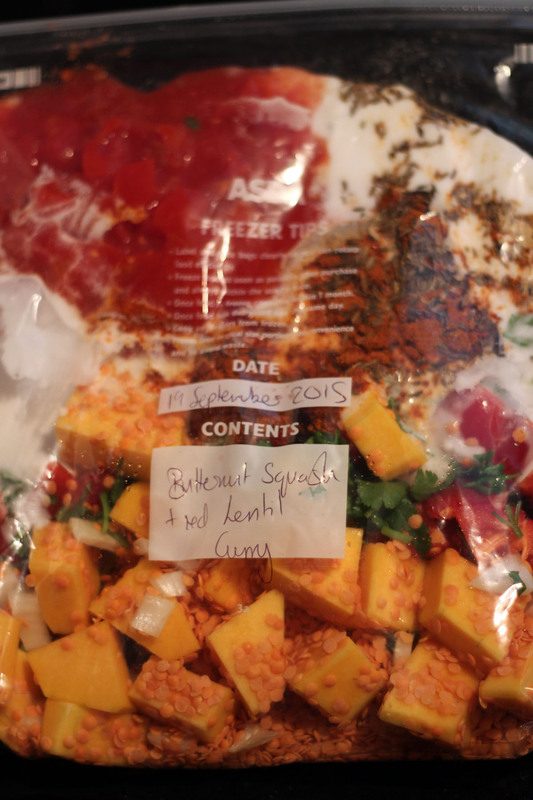 Place the ingredients into a freezer zip-lock bag and freeze until the night before needed. Defrost overnight the day before cooking. Serve over your favourite pasta with garlic bread and a green salad. A handful of okra (sliced), 1 onion (diced), 1 red pepper (diced), 1 green pepper (diced), 2 garlic cloves (sliced), 1 tbsp fresh ginger (crushed), 3 tbsp Thai red curry paste, 1/2 can coconut milk, 1/2 can tinned tomatoes, 1 tablespoon soy sauce and a handful of fresh coriander. 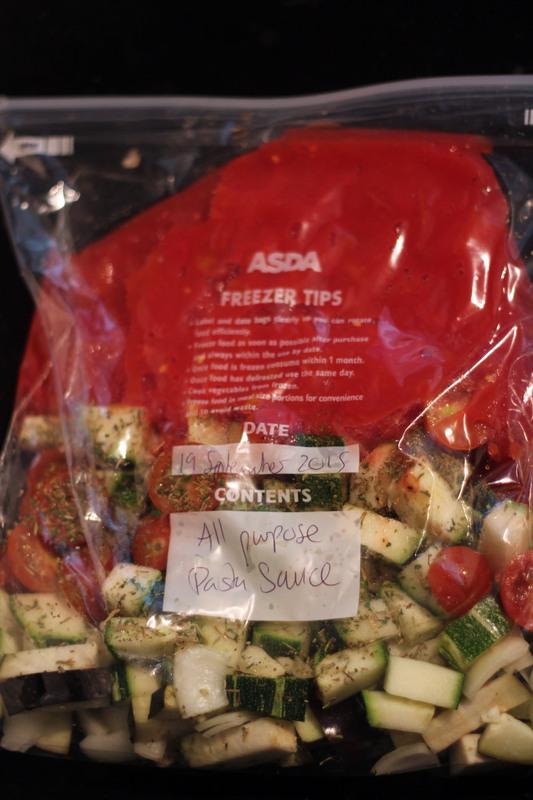 Place into a freezer bag and freeze until the night before needed.Defrost overnight the day before cooking. Cook on LOW for 8 – 10 hours. If the sauce is a little thin turn your slow cooker on high and leave the lid off for the last half hour. Add juice of one lime before serving over white rice. Place the ingredients into a zip lock bag and freeze until the night before needed. Defrost overnight the day before cooking. 4-6 hours before you’d like to eat, add 1/2 pint good quality veg stock and a bay leaf before cooking. Cook on LOW for 4 – 6hours. Hi, I just found this post as am looking for some winter veg pot recipes (I’m a novice vegetarian) . They all sound great. I was just wondering what liquid you use for the chickpea and spinach curry recipe? As there is none listed, like passata or coconut milk… Is it missing or do you not put any liquid in that one? Also the helpful freezer chart says not to freeze aubergine, how did you get on with freezing it? Hi Sarah! Welcome to the blog. Good spot! There should be a tin of tomatoes and half a tin of coconut milk in the curry. Will amend as soon as I can. I’ve had no issues freezing aubergine to later slow cook. It can retain lots of water but that’s not so much of an issue when you slow cook. It will be lovely and tender when cooked. Enjoy! Thanks Emma. I think i did improv with the tomatoes, and really happy – thanks for sharing. I see no way to easily print these recipes, am I missing something? You should be able to print the webpage directly from your browser, otherwise simply copy and paste them into a word doc. Unfortunately the site doesn’t support more than one printable recipe per page though I am looking to rectify this! If you have any other feedback good or bad I’d love to hear it! I cut an paste them into word to make pages for my recipe book. couldn’t find a print button either. They are worth doing though! I’ve tried a couple and they are very tasty. Chickpea and spinach for dinner tonight. I make it up in big batches fresh, and then freeze the cooked portions for easy weekday use. I’m the only veggie in the house so it saves me being Masterchef after a day at work and an an early evening of child herding. Hello would love to make theses 7 meals is there a shopping list ? Hi Katie im afraid not at the moment but great idea! I will have to update the post! WOW! Well done 😀 enjoy! The infographic says to not freeze eggplant. Have you had any trouble with your Aubergine? Hi Lydia. Ive had no trouble at all. 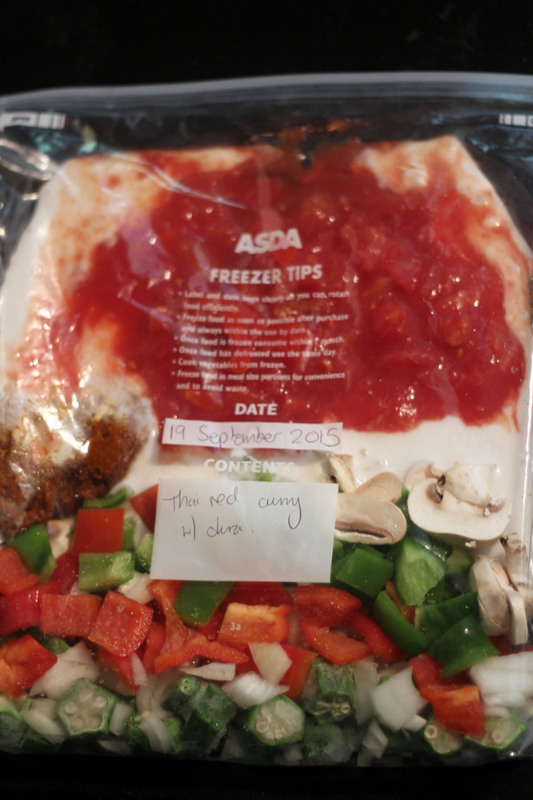 I think its not a great idea to freeze aubergine if you want to thaw it out and cook as though it was fresh. In slow cooked food it breaks down anyway so not affected by the freezing process! Love these, thanks! When you say to “top up with water,” how much water are you talking about? Hi Andrea. I simply fill my slow cooker up to its maximum mark (roughly 2/3rds of way up). This ensures it wont dry out. Hello, When you say “tinned tomatoes”, how big of a tin do you mean? 15 oz seems pretty small for some of these dishes. Tin of tomatoes in UK is 400g not dure what that is in oz. These are only to fill a small 2 person slow cooker anymore and youd go over the max level! Am I wrong or is there a red liquid (tomatoes?) that should be added to the chickpeas and spinach curry? It isn’t in the ingredients list, but I think I see it in the photo. Hi Anouk, you’re right! Sorry I missed it off. There should definitely be a tin of tomatoes in there. Will amend now. Enjoy! Haven’t tried your recipes yet, but these are exactly what I’m looking for. Next week’s meals are taken care of! Thank you. Especially because we are vegetarian who eat little to no cheese, so many recipes I come across don’t fit. These look healthy and delicious. Thank you! My pleasure Cheryl. Thanks for stopping by. I hope you enjoy them! Hi Emma. I cant wait to try all of these recipes. Just wondering if the chickpea and spinach curry has coconut milk in it. I dont see it as an ingredient but i think i see it in the picture. Hi Julie! Apologies you’re correct it should have a tin of coconut milk in. I will update! All the best. Hi, just to let you know that parmesan cheese is NOT a vegetarian option. You can source a vegetarian hard cheese that is similar though. (Morrisons if in the UK or Gibraltar). How long would you suggest cooking there if you were starting with fresh ingredients and not freezing first? Thanks! Can’t wait to try! Hi Julie. Id probably knock an hour or two off the time. Hi June. I’ll admit im not sure about refreezing. Youd probably be fine putting leftovers in fridge and reheating the next day. Hey. Can I use fresh tomatoes instead of canned tomatoes? Also can i just add water instead of coconut milk? If yes, how much water should i add? Hi Manali you’d lose both flavour and consistency doing that I’m afraid! I wouldn’t recommend it. Please please please do another post like this. I’ve just finished it and all of the recipes were amazing. So easy to do, filling and tasty. As a busy teacher with a hungry vegetarian other half to feed these recipes have saved my life during our kitchen renovation. I feel that they’ll become a staple in our diet now. But (sorry to say) NEED MORE. Hey Tori! Sorry to keep you in suspense. Will work extra hard to get another round up for you! My daughter and I live in the U.S. She has asked me to make these recipes during my upcoming visit, but I’m having a problem. You don’t provide the sizes of cans and tins (beans, coconut milk, chopped tomatoes). I do see in the comments section the tinned tomatoes are 400 grams. Also, would you mind providing amounts for mozzarella cheese, parmesan and breadcrumbs for the Aubergine Parmesan recipe, as she is having me prepare multiple batches of this recipe for several friends who are expected to deliver their babies during my visit? In the UK tins are usually 400g / 400ml (for tomatoes, beans, cocnut milk etc). With the mozarella, parmesan and breadcrumbs I use one ball of mozarella (roughly 100g drained weight) and I simply sprinkle a couple of handfuls of breadcrumbs and roughly 4 tbsps of grated parmesan over the top. The beauty of these recipes is that they are not an exact science so just go with what looks right for you! Hi I LOVE this list. Most freezer meals are chicken or beef based. I’ve tried two of them (delish) and the other 5 are still in my freezer to be eaten this week. Are you going to prepare another list? I would love to have another round of different recipes to switch off to. These recipes look so tasty! Pl3ase can you give me an indication ‘re how much water I should be adding? My slow cooker is really big and I fear that if I filled it to the top I would end up with soup. Hi Kate I only have a small slow cooker and so dont add any more than a pint of water. I would eyeball bases on your slow cooker. Sinply top it up to the desired consistency – if youre slow cooker is good it shouldnt leak much steam. If it does abd you often find sauces reduce quickly in your slow cooker add a bit more. I hope that helps! Thank you for sharing these recipes! I love having dinner ready when I get home, but doing all the prep before work is a hassle. The eggplant parm was a hit, and today I made up two bags of the Thai curry for meals later this year. I do have one question on the Thai curry tho. As I examine the picture one last time it appears that the bags contain sliced mushrooms. Was that missing from the ingredient list? I just made the mushroom barley freezer meal for a new mom. Thanks!